Email marketing puts a professional face on your personal communication. Update members to important group news, meetings and events. 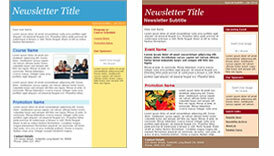 Boost your visibility with a professional, organized and attractive newsletter. Motivate more action, donations, and participation with the power of graphics and video. A simple and easy to use drag and drop interface means your organization delivers professional email content in minutes. Online Surveys provide instant, measurable feedback from your members. Email List Management and Sign Up Forms provide membership automation, sorting, unlimited uploading and sending at no additional cost. Email Marketing Manual for Associations & Organizations. Download the free PDF or read it directly from our website today! Keeping your group, association, corporation, industry, trade, union or organization connected just got easier with Benchmark Email templates. Personalize your message to everyone on your member list, keeping everyone on the team in the loop.